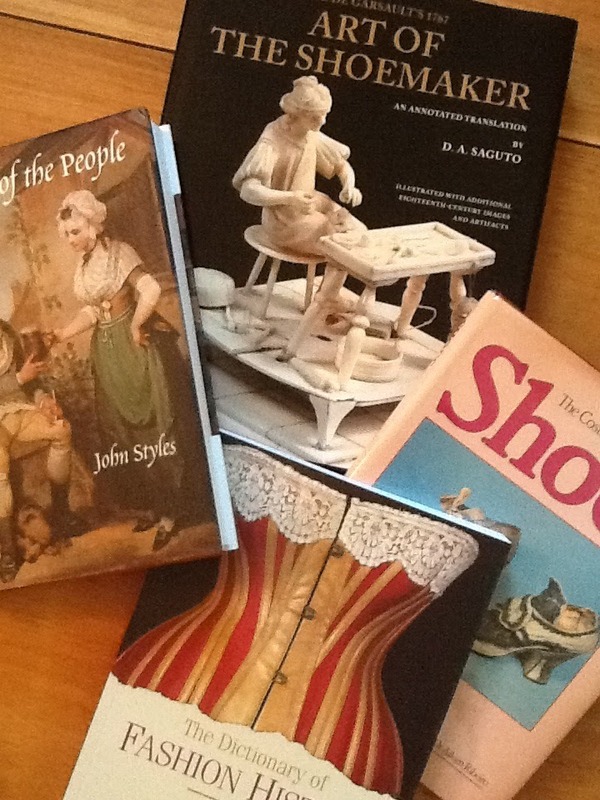 Overview of "Past Dress, Current Fashion" Costume Colloquium III, Florence, November 8-11, 2012. 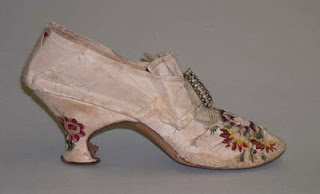 The author is pleased to be presenting with London shoe designer, Emma Hope: "Brocade & Paste Buckles: The London Shoes of Thomas Ridout, James Davis and Emma Hope"
Top - Courtesy, Emma Hope, 2011 Collection from "Thread: Regalia for Feet"
Suzani is a type of embroidered decorative tribal textile made in Tajikistan, Uzbekistan, Kazakhstan and other Central Asian countries. Suzani is from the Persian “Suzan” which means needle. While suzanis typically have a cotton base, the backing is frequently of silk, which is then embroidered with silk or cotton thread. The primary stitches used are the chain, satin and buttonhole. Couching (decorative thread laid on fabric in a raised line, which is then stitched in place with a second thread) is also frequent. 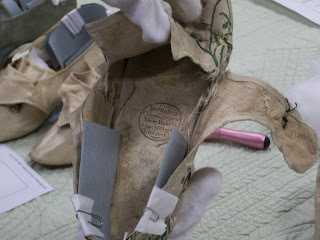 Suzanis are often constructed in multiple pieces that are then joined. 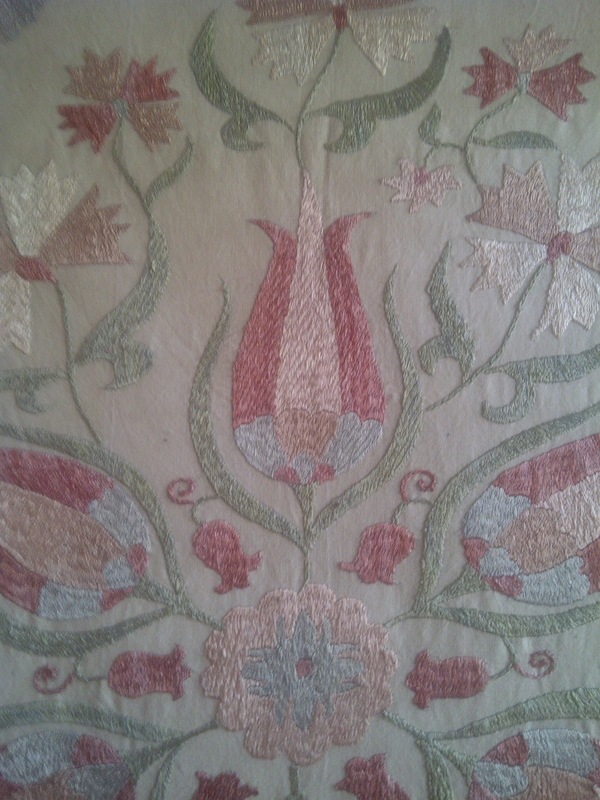 The oldest surviving suzanis are from the late 18th and early 19th centuries, but it seems likely that they were in existence long before that, based on historic detailed descriptions of embroideries that were probably forerunners of the suzani, dating back to the 1500s and Silk Road trading. Tradition maintains that suzanis were made by Central Asian brides as part of their dowry, and were presented to the groom on the wedding day. Among the most frequent design motifs are flowers, such as tulips and carnations, leaves, vines and fruit, and sun and moon disks. Fish and birds are less common. 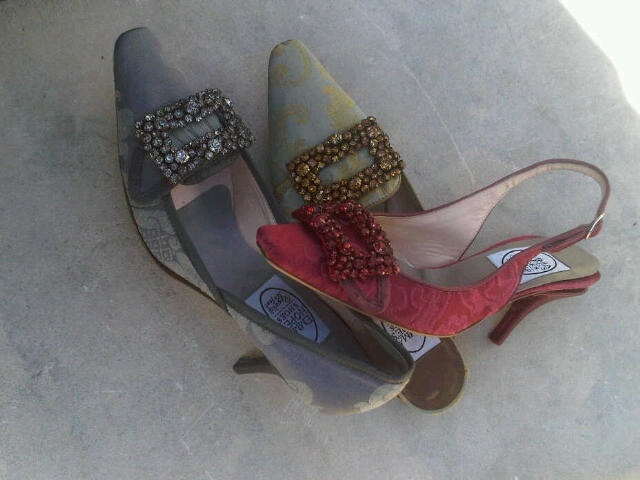 In preparing this post, which was generated by a chance purchase of suzani shoes in Newburyport, MA. (see forthcoming), the author discovered a rich trove of on line information about both historic and contemporary suzani. Knitting Letters A-Z “S is for Suzani” is an outstanding reference, intriguing read and alluring approach. The author thanks Nina of Meyra (www.meyraus.com) in Newburyport, MA. for sharing her knowledge of, and interest in, suzani textiles. Fashioning the City conference program announcement. Looking forward to presenting the first results of nearly three years of research and collaboration with London shoe designer, Emma Hope and Curator, Tara Vose. A few favorites to share. Please do comment on these titles or make recommendations. Summer thunderstorms make wonderful opportunities for mandatory reading! 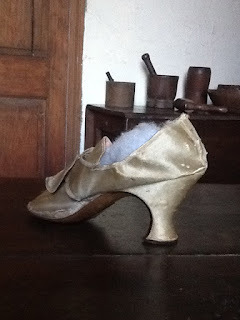 Its Reception in Colonial America"
In the world of the Georgian London shoe trade, the survival of dozens of labeled ladies shoes in North American collections provides a unique opportunity for the costume historian. 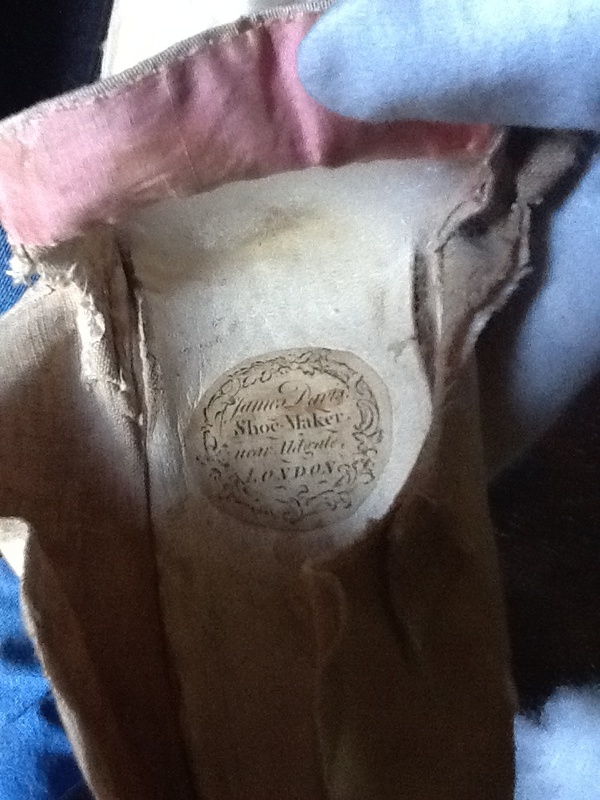 Having examined an abundance of these shoes, ranging from the 1740s-1810s, the focus of this post will be on two well- established cordwainers and what their labels reveal. Working both independently and in partnership, James Davis and Thomas Ridout, affixed labels to their shoes by the mid-18th century. Stylistically, the labels are round or feature a "shield" set within the roundel. 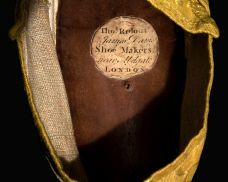 The border is simple, although, in the example of Mehitable Rindge Rogers (1725-1803) shoe (c.1760-1770) by Davis, the treatment has a more baroque flourish. (Warner House, Portsmouth, NH. 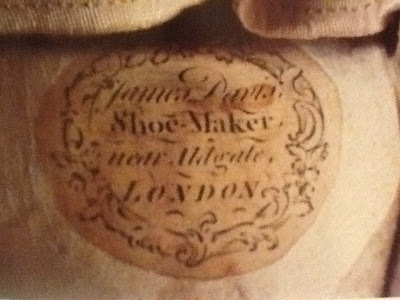 USA) The label notes that the shop location was near Aldgate and research reveals that this was in the heart of the Ward of the Cordwainer. Indeed, Ridout and Davis were no doubt at the height of their production, when, in 1763, the late Medieval Aldgate was taken down. The very existence of labeled work attests to issues surrounding professionalization, recognition and advertising. Further, for those shoes destined for the export trade, the existence of a label may have been a distinguishing factor for tariff payments on British goods. Ladies shoes are frequently listed separately on ship's manifests, cargo lists and Custom House records in seaport cities such as Salem, MA. and Portsmouth, NH. The author thanks Tara Vose, Emma Hope, Bridget Swift, Carolyn Roy, Ned Lazaro and Tom Hardiman for their ongoing assistance.